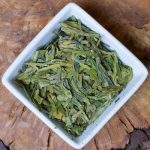 Also known as Longjing, this tea has the depth and customary toastiness expected from a fresh Chinese green tea. This 2018 harvest took it’s time this year, but it is well worth it. It’s a pleasure to carry such a good quality version of this tea as there is a lot of inferior versions that don’t actually come from the original Westlake region. This is the most asked-for Japanese tea. The toasty flavor imparted by the roasted, popped rice brings such a pleasant flavor to the Sencha base. Genmaicha was developed during WWll in response to the shortage of green tea. After the war it was shunned as a “poor person’s tea”, but has gained a new popularity. A high quality, unique, savory green from mainland China; its full body and grassy depth reminds me more of a high quality Japanese tea. We’re lucky to carry this again in 2018 (the Chinese government keeps threatening to convert the land for manufacturing). This is from a small family farm in the mountains of Guangdong Province and the care and attention to quality is highly evident in the wonderful buttery flavor. This tea is a lovely small leaf, organically grown green from Fujian Province. It steeps up grassy and sweet–a great value! Fukamushi Sencha means “deep steam” sencha and I totally love the taste difference in this tea. Sencha is the most commonly consumed tea in Japan and this particular one is full of rich flavor–it easily stands up to two steeps. Personally I prefer the first steep of my green teas because I think most of the L-theanine comes out in the first steep and I like the sweet flavor it imparts. Steeping this tea at 170F brings out the savory, delightfully grassy character of the tea. 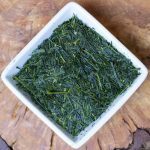 This is a wonderful shade-grown green tea that is about as savory and rich as anyone could want. Why shade-grown? It stresses the tea plant and forces intense color, flavor and sweetness. It’s also a little higher in caffeine. A wonderful blending green tea that tastes great on its own or blended with flavors and botanicals. 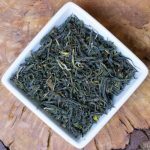 A lovely green tea grown on the island of Shousan off the eastern coast of China. This tea is bright and fresh with the tiniest hint of toastiness. A great value. 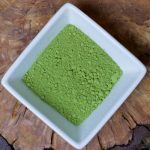 Rolled into tiny pearls, these shiny, grey-green, hand-rolled leaves typically make a strong, somewhat astringent cup, with a characteristic smoky edge from high firing.